Provide comfort for the family of Jesse Robinson with a meaningful gesture of sympathy. Mr. Jesse Harold Robinson, age 97, of Irving, Texas, passed away on Sunday December 16, 2018 at Watkins-Logan Texas State Veterans Home in Tyler, Texas. Jesse was born at home near Winnsboro, Texas on April 25, 1921 to the late John and Gertrude Bailey Robinson. Jesse lived and worked on the farm until he was twenty (20) years old when he joined the U.S. Army Company D 155th Infantry where he served as a combat infantryman ammunition bearer from November 25, 1940 to December 19, 1945 during World War II. While fighting for his country, he faced tough adversary in the troops of the Japanese Imperial Army during his military wartime service in the South West Pacific Theatre in the territory of New Guinea Southern Philippines where he earned the following decorations: American Defense Service Medal; American Theater Campaign Medal; Asiatic-Pacific Theater Campaign Medal with 2 bronze stars and 1 bronze arrowhead; Philippine Liberation Medal with 1 bronze arrowhead; Good Conduct Medal; Victory Ribbon; 1 Service Stripe and 3 Overseas Bars. Mr. Robinson was a lifetime member of the Dallas Chapter 32 of the Disabled American Veterans (DAV). 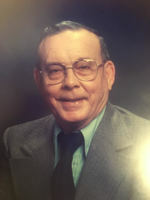 On January 2, 1951 he married Lila Mae Overstreet and raised one son David Harold Robinson while working at Red Ball Motor Freight, Dallas, Texas for over 29 years as a truck driver. After retirement in 1981, his hobby became making musical instruments. His wife preceded him in death on August 26, 2017 after 66 years of marriage. Mr. Robinson was a kind, patient, gentle man as well as a devoted husband and father providing well for his family and extended family members. Also preceding him, were his parents; brothers, Howard Robinson, Hubert Robinson; sisters, Lorrene Lindley and Pauline King. He is survived by his son, David Harold Robinson and wife, Jalayne of Winnsboro. Two grandchildren, Brian David Robinson, and Raegan Denell Robinson Swann and husband, Chris of Winnsboro. One great-grandchild, Capri Denell Swann of Winnsboro. A graveside military service officiated by Bro. David Hicks of Lindale will be held Wednesday, December 19, 2018 @ 10:15 a.m. with interment at the Dallas-Fort Worth National Cemetery in Dallas, Texas with pallbearers: Gene Burton of McKinney; Jeff Zimmerman; Chris Swann; Brian Robinson & David Robinson of Winnsboro. To send flowers in memory of Jesse Harold Robinson, please visit our Heartfelt Sympathies Store.